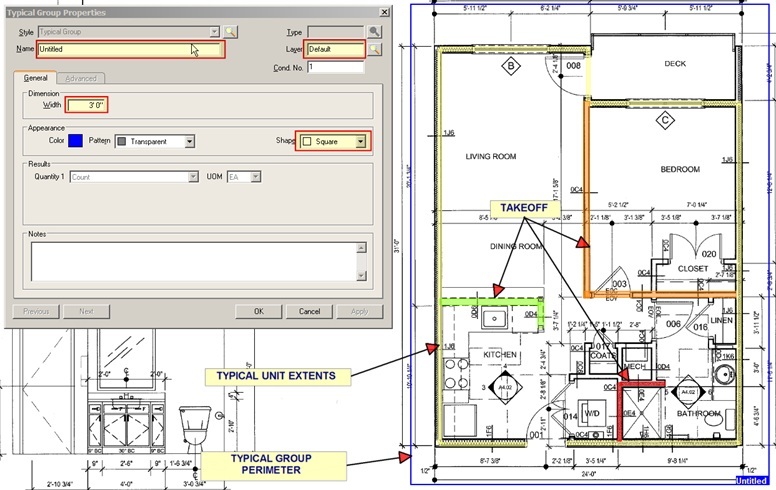 Efficiency Tip – On Screen Takeoff: Typical Groups – Gould Design, Inc. Some time ago, I wrote a blog about electronic takeoffs – using On Screen Takeoff (OST). Today, I would like to share a feature tip to improve your efficiency and speed. When doing takeoffs of larger jobs, you typically come across repetitive design of some sort. Usually, large buildings will consist of a dozen of typical smaller designs – for example in case of apartment building, you will have maybe 10 typical units that repeat in various patterns. If you are using On Screen takeoff, you can either takeoff each typical unit and copy and paste to its locations in the project – OR – if you want to do it the slick way, you do the takeoff of each unit and create what is called a “typical group”. This typical group now acts as an entity of its own – I like to say it is a LEGO block. You define the block, put all items in a colored frame and start ‘stamping’ these blocks in your project. So far so good, right? You may ask why would I do typical group instead of copy and paste? The answer is very simple: you want to save yourself some hassle. Seriously. Copy and paste is good for a small project where you do two or three copies and you are done. If you have 400-unit apartment building in 5 floors that consists of 10 unit types, you would for SURE use typical groups because…once you have defined the group and copied it 20 times in your job, you can go back to the definition and make any type of adjustment that will reflect in all instances of that group – so in this case, your 20 copies will be changed in a heart beat. Martin Horak – Gould Design Inc.
Any Idea on how to set the group number if you are using two different schemes across the apartment complex?